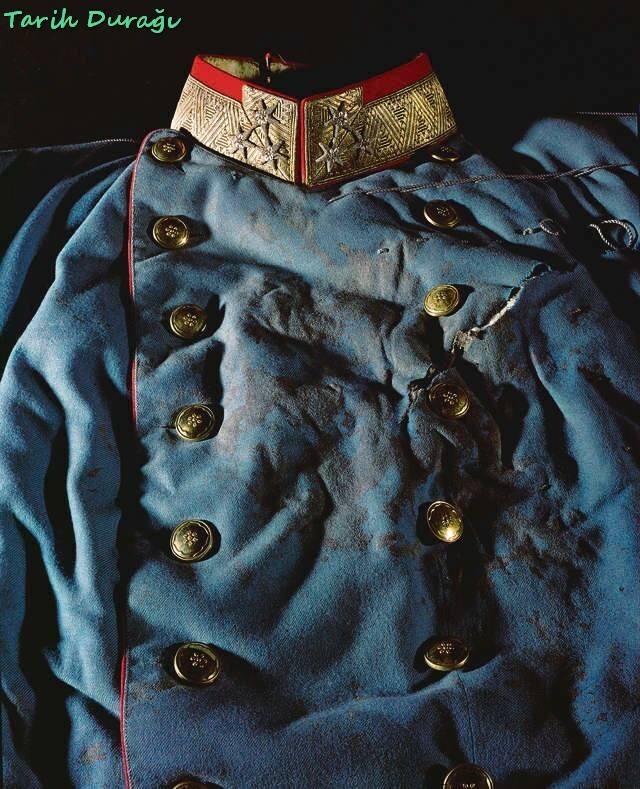 The blood-stained jacket of the Austro-Hungarian Archduke Ferdinad, who was killed during World War I. Many of his assassins during his visit to Sarajevo on June 19, 1914, were saved without getting injured. However, on June 28, 1914 at 01:15 am, he was attacked by Serbian assassin Gavrilo Princip while traveling on the streets of Sarajevo with his wife of an open automobile. The lead from Princip's gun went in and out of his neck, stabbing his back. Franz Ferdinand and his wife Princess Sophie are killed on the assassination. The assassin caused the World War I by waging war on Serbia, Austria-Hungary, responsible for the assassination, because the Habsburg dynasty, which held the two countries together, killed the only crown prince. The killing of Archduke Franz Ferdinand by a Serbian nationalist was the spark that started World War I. Austria-Hungary, which held Serbia responsible for this, occupied Serbia on 27 July 1914. As Russia supported Serbia, Germany declared war on Russia as a supporter of Austria-Hungary; France supported Russia in the framework of the Bilateral Alliance Treaty signed in 1892. Germany then declared war to France. German troops entered Belgium to attack France. The United Kingdom, promising to help Belgium in the face of a massive attack in 1839, declared war on Germany on 4 August 1914. Thus World War I started in Europe.